Product prices and availability are accurate as of 2019-02-28 11:58:56 UTC and are subject to change. Any price and availability information displayed on http://www.amazon.com/ at the time of purchase will apply to the purchase of this product. Inspired by the vibrant, breathtaking beauty that rises from April's rains and sunny days, Kate Aspen brings you the "Blooming" Bottle Stopper--a unique wedding favor designed to delight your guests at the reception and when they take them home. Bursting forth from the supple, spring-green stopper and stem is a translucent pink flower with a green center. As enchanting as the flower is the presentation. 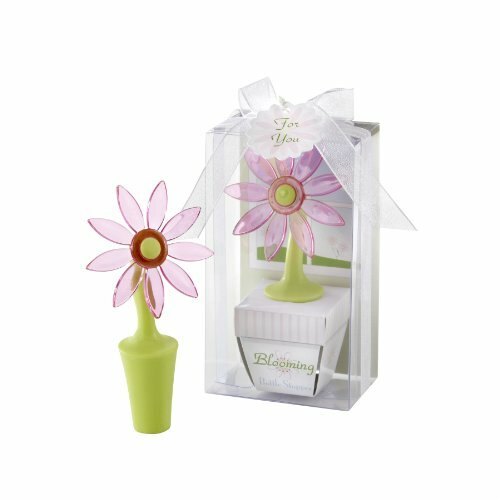 The flower "grows" in a pretty, little lavender pot inside a clear display gift box. On the front of the flower pot, it reads "Blooming Bottle Stopper." Behind the pot is a "window" that looks out onto a sunny spring day, with bright-blue sky, white clouds and a lovely field of flowers. A sheer, white organza ribbon and bow and matching, flower-shaped "For You" tag complete the presentation. The "Blooming" Bottle Stopper measures 4-inch h by 2-inch w, and the gift box measures 4-1/2-inch h by 2 1/2-inch w by 1-1/2-inch d. .